Algal blooms, including red tides, are natural occurrences. They are part of the complex life cycles and ecological balance of our marine ecosystem. However, excess nutrient pollutants, such as nitrogen and phosphorus, from human activity can disrupt the nature’s balance creating devastating blooms in our waterways that are more intense, larger, and last longer. Protecting our bays and the Gulf of Mexico from excess nutrient pollution is a year round job, and everyone has a role to play. We can and must be better stewards. It starts in our homes and communities and extends to civil servants and our elected officials. A healthy bay is everybody’s business. Florida red tides start out in the Gulf of Mexico, but they can feed on excess nutrients in our bays from rivers and runoff to fuel their growth. Sarasota Bay Watch believes that one solution to the problem of excess nutrients is to repopulate our waterways with shellfish like, clams, oysters and scallops. Native clams, once so abundant in the bay, actually eat red tide. Each clam is a workhorse, filtering over 10 gallons of water per day for 30 years or more. And their thick shells protect them from most predators. Unfortunately, we no longer have many os these natural cleaners left in our waters. 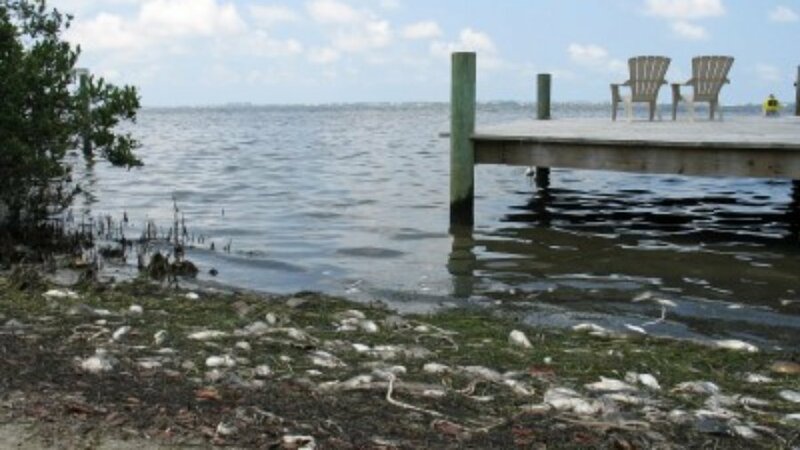 The red tide organism, K. brevis, thrives in warm waters with excess nutrients, which can lead to toxic and economically damaging blooms. The extreme and extended red tide we recently experienced underscores the urgent need to repopulate the bay with shellfish, particularly clams. Restoring shellfish to Sarasota Bay is one way to help make the bay be more resilient to challenges like excess nutrient run-off and algae blooms. Dr. Steve Geiger, Research Scientist, Fish & Wildlife Research Institute, Florida Fish & Wildlife Conservation Commission. This is why Sarasota Bay Watch, and our army of community volunteers, are working to restore clams and scallops to the bay – rebuilding shellfish populations may be one of the fastest and most cost effective ways to mitigate red tide impacts, both environmental and economic. In addition, these shellfish sequester loads of carbon and provide abundant food for diverse marine life. – clam restoration is a win, win, win solution. It is now more important than ever to restore natural shellfish populations to maintain clean water and a healthy bay, as well as a better quality of life for Sarasota’s residents and visitors. 3. Over 1600 mature, ready-to-spawn adult scallops into the bay in protective cages to avoid predation and to increase likelihood of successful spawning. SBW’s native clam restoration pilot project to grow 250,000 young adult clams started in January 2017, took $20,000 and 18 months to complete. The clams were professionally grown near Captiva Pass, south of Boca Grande and the project culminated in a series of harvests from that area, transporting the clams to Sarasota, and releasing them into Sarasota Bay. Our native hard shell clams survived the severe and persistent red tide, and the whole process from grow out to release went extremely well. Accordingly, SBW now is working to raise more funds and expand the Clam Restoration Program to 1,000,000 clams in the next phase. If you’d like more information about Sarasota Bay Watch please visit sarasotabaywatch.org.